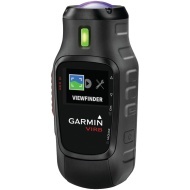 alaTest has collected and analyzed 92 reviews of Garmin VIRB. The average rating for this product is 4.0/5, compared to an average rating of 4.0/5 for other Camcorders for all reviews. Reviewers really like the image quality and durability. The size and portability are also appreciated. Comments are divided on the color. Some have doubts about the memory and viewfinder. We analyzed user and expert ratings, product age and more factors. Compared to other Camcorders the Garmin VIRB is awarded an overall alaScore™ of 88/100 = Very good quality. alaTest has collected and analyzed 35 user reviews of Garmin VIRB from Amazon.co.uk. The average user rating for this product is 3.8/5, compared to an average user rating of 4.0/5 for other Camcorders on Amazon.co.uk. People really like the battery and image quality. The size and portability are also mentioned favorably. There are mixed opinions on the design and price, while there are some negative views about the color and memory. High-quality 5.7K 360-degree video capture. 4-channel audio. Waterproof to 33 feet. Integrated GPS. Expensive. Internal stitching limited to 4K. Mac software doesn't support 5.7K output. Short battery life when recording 5.7K. Accessory mounts easily lost.